Two doctors who served in the Wanni area up to the end of the war, told the Lessons Learnt and Reconciliation Commission (LLRC) of the personal anguish and trying moments they faced during those difficult days, while Maj. Gen. Shavindra Silva, Commander 58 Division during the military operations, in his second appearance before the LLRC, gave details of atrocities committed by the LTTE against civilians in the war zone. Dr T. Sathiyamoorthy, who was trapped along with hundreds of civilians in the Puthumathalan and Mullivaikkaal area from February 2009 onwards, till troops moved into the area on May 15, recalled the deplorable conditions under which they managed to survive. “Many did not have access to a square meal per day, while water was hard to get. Conspicuously absent were toilets, where even the most conservative women folk had to go in the ‘open’. As a doctor, I was sick at heart, witnessing this human tragedy,” a somber Dr. Sathiyamoorthy told the Commission on Friday. He also spoke of the dedication with which the Health staff worked continuously and untiringly, along with many volunteers, to provide whatever relief possible to the sick and injured civilians, and spoke of his personal frustration at not being able to do more for the people. “The golden lesson on peace that I nurtured since my childhood, was revisited in the conflict zone, and made me determinedly decide that one must leave no stone unturned to resolve this conflict and achieve lasting peace at whatever cost to anyone’s ego or vain pride,” said Dr. Sathiyamoorthy, who is now Medical Superintendent- General Hospital, Vavuniya. Dr V. Shanmugarajah, District Medical Officer- Mullaitivu from 2006 to May, 15 2009, recalled how, as troops moved deeper into the LTTE controlled areas, civilians as well as medical staff moved into Puthumathalan and Mullivaikkaal areas, setting up makeshift hospitals to treat the sick and the injured. 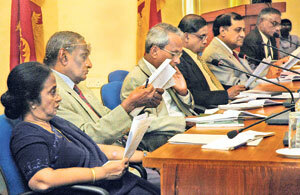 “We did not distinguish between LTTE cadres and civilians, and treated everyone alike,” he told the LLRC. He said that medication and medical equipments were provided them by the Government, but, by about February 2009, the area they were confined to was highly congested, and medical stocks were running low. “The seriously ill patients were moved to Puthumathalan and sent by ship with the assistance of the International Committee of the Red Cross (ICRC).” However, even seriously ill patients were permitted to leave by the LTTE only after they were convinced that, that specialised treatment was not available in the war zone. Dr. Shanmugarajah said that on May 14, he was informed by the Government Agent that they should remain where they are, as the Army would come and rescue them. By May 15, troops had entered the area, and the sick and injured civilians were taken away for treatment to hospitals in Vavuniya,” he said. When questioned by the Commissioners on the veracity of news reports attributed to him, during the last few weeks of the war, quoting high casualties among civilians, Dr. Shanmugarajah said that the situation had compelled him to inflate the figures. “If the number of injured was 75, we had to say it was 275 or even 575. That was the situation at the time,” he said. When asked by Commission Chairman C.R. De Silva as to who compelled him to inflate the figure, he said it was done at the behest of the LTTE. He also said that the figures of the dead and injured were compiled by the hospital staff which he would make available to the Commission. Dr. Shanmugarajah also gave evidence in camera for nearly 45 minutes before the Commission, due to the sensitivity of the information being dealt with. Maj. Gen. Shavindra Silva, in his second appearance before the LLRC, said that, during the humanitarian operation, troops had found that the LTTE had turned schools into hideouts, churches as mortar and bunker positions, and hospitals as artillery positions. “There were many instances where we knew that LTTE cadres were hiding in kovils, churches, schools and hospitals and other public places. It would have been easier to finish off terrorism well before hand, if we had fired upon these places, but we maintained our policy on zero casualties to civilians and damage to public property,” he said. Maj. Gen. Silva also said that there were armed civilian elements of the LTTE, who were engaged in fighting against the military. “A majority of the LTTE cadres were in civvies, especially during the last phase of the war. Jaffna leader Theepan, along with other cadres were in civilian clothes, when found killed in the battlefield,” he said. He said the militants were identified by their identity numbers and blood groups around their necks. Maj. Gen. Silva who, at present, serves as Sri Lanka’s Deputy Permanent Representative to the United Nations, New York, also said that, troops took every possible measure to protect human lives, while all suspects who surrendered, were treated under the due process of law. Head of the Department of Political Science and Public Policy, University of Colombo, Dr S.I. Keethaponcalan in his appearance before the LLRC last week said, “Now that the war has ended, it should be treated as an opportunity to move forward and build national unity on the basis of equal citizenship. We should have a systematic and well defined scheme to deal with minority concerns”. He said that, the Tamil community, currently, in his view, has three fundamental fears, politically, which are; a conspiracy to colonise the north and east to weaken their claim to these areas as their homeland, belief that the Government also has schemes to make Tamils second class citizens in the land, and that, as the Tamils have no capacity to exert pressure on the Government, to force it to concede political power, devolution of powers to the provinces will be dropped. He said that, the Tamil people should also enjoy the benefits of the end of the war, and this should be implemented through de-militarisation of society in general, and reducing the presence of the armed forces to a minimal level in the north and east in particular. He also recommended that a special commission be appointed with immediate effect, to deal with the disintegration of families caused by constant displacement, forcible recruitment by armed groups, abductions and disappearances. Former media spokesman of the LTTE Velayutham Thayanidhi, alias Daya Master, giving evidence before the LLRC at St Anthony’s church in Kayts, said that, mistrust and failure to understand each other’s viewpoint, between the Tamil and Sinhala communities, has been the cause of all the destruction this country witnessed. Daya Master said he functioned as the officer in charge of the media division of the LTTE’s political wing, but, the abrogation of the Ceasefire Agreement and the worsening situation of the already suffering people in the north and east, caused him to quit the LTTE. “Already, a large number of people had been killed, with more people caught up in between the two fighting parties. Just like those people, he too went to the brink of death. The area of conflict cannot be demarcated completely. The dimension of the war was wide and varied. Deaths kept increasing by the day,” he said. The former lTTE member said that he cannot forget those scenes. “At times, I too wept for the thousands who were killed in the war. These deaths were quite unwarranted. When the war intensified, a few senior members of the LTTE and intellectuals sent a letter to the LTTE leader, through LTTE advisor Bala Kumaran, but the response was a disappointment,” he said. He said he was among many, who, in a situation of unlimited death and destruction, decided it was best to live peacefully by joining the government. “I am one of them,” he said. Daya Master said that, he, along with George Master, surrendered on April 28, 2009, to the Army. “When we surrendered along with other people, the Army separated us from the rest, and treated us well, but I cannot say how the others were treated. Now I am out on bail,” he said. He also called for the early release of detainees, and urged the Commission to show greater concern to persons missing during and after the war. “Action must be taken to restore normality to those in the Wanni who were displaced and resettled. Greater assistance must be provided to those who have lost their livelihoods.”He said the Commission must make recommendations in their report for lasting and permanent peace, as people are apprehensive of the Commissions appointed in the past. “Had the LTTE made proper use of the opportunities availed in 1987, 90, 95, and 2000, these disasters could have been averted”.